Every four years, two children disappear from the small village of Gavaldon: one beautiful, delightful child, and one ugly, horrible child. No one knows where they go, but the village children will come across new fairy tales years later that star characters eerily similar to their missing playmates. Most of the villagers find this to be a terrible situation, but beautiful Sophie has been waiting all her life for her chance to be stolen away and become a fairytale princess. 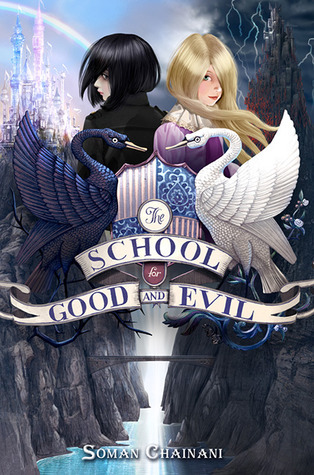 Her best friend, miserable Agatha, decides to try and protect Sophie the night she hopes the mysterious Schoolmaster will steal her away, but when he comes he decides to take them both, and before they know it they have arrived at the School for Good and Evil. Something is very wrong, though. Agatha has been taken to the School for Good, and Sophie to Evil. When they confront the Schoolmaster, they learn that their very own fairytale has already begun to write itself and is out of their hands. That doesn’t stop Sophie from trying to get in the School for Good where she thinks she belongs, while Agatha makes desperate attempts to get them both back home. Will the girls get out, switch schools, or learn to rule the Schools they’re in? This book is non-stop action. The author made his name as a screenplay writer, so this story really moves like a movie- which is what it is rumored to be in a couple of years! Also, this is the start of a series, so look for the sequel in early 2014. This book is perfect for fans of Harry potter, and anyone who loves magic, action, and school stories!